"These fit great! ... Special Design ..."
"Very comfortable pillow covers, made with cotton, Very fresh looking will look good in garden room..."
"Beautiful pillow cover. True embroidery. I bought a pair of these and they are beautiful on my sofa. Lovely detail and quality finish...."
YOUR SEARCH FOR THE BEST, MOST COMPLETE DECORATIVE THROW PILLOWS COVERS BRAND IS FINALLY OVER! If you are looking for a comfortable throw pillow covers for your sweet family, or you want to add some color to decorative your living space, SLOW COW is offering you a great experience of eyelet embroidery cushion cover with special design. ❤ SLOW COW has offered 6 different colors for man & women & kids. ❤ SLOW COW embroidered pattern only on one side, other side is the same color solid. ❤ SLOW COW pattern is more vivid and stylish via Embroidery Technique. This throw pillowcase is a wonderful decor for home, bedroom, living room and your sofa. ❤ SLOW COW Pillowcases is made by natural antibacterial cotton for high quality, soft and comfortable, healthy, breathable, easy washable and dryable, with heavy embroidery embellishment. 1.Due to different screen display, the color of the actual item may slightly from the above images. 2.As a result of manual production, sewing and cutting will inevitably occur a little deviation, please allow 1-2cm. ❤ Get your gifts today, We hope our products could add spice to your life! ❤ Included 2PC cushion covers. No cushion inserts, embroidered pattern only on one side, other is solid. 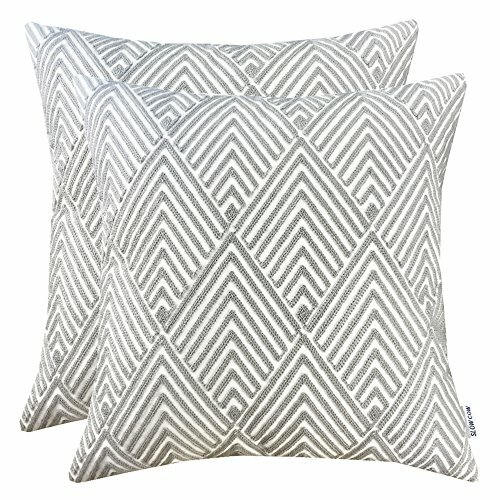 ❤ This is modern geometric embroidery throw pillow covers, not printed. Made of fabric with perfect natural organic cotton. ❤ 18 x 18inches (45 x 45cm), as a result of manual production, sewing and cutting will inevitably occur a little deviation, please allow 1-2cm. Invisible/Hidden zipper closure in one side. ❤ Wash in cold water or 30℃ by hand then lay flat to dry. Do not bleach. Do not tumble dry. Do not dry clean. ❤ SLOW COW is a Registered American Brand. Please only purchase from SLOW COW, we do not guarantee the quality if your buy from other sellers. Buy from us, we offered free returns without any reason. If meet any question, please contact customer service, we promise to solve it. If you have any questions about this product by SLOW COW, contact us by completing and submitting the form below. If you are looking for a specif part number, please include it with your message.